Hi there, folks. Today I’m super excited to share a great video in which I interview reality star Dog Hopkins from Property Wars. Doug is going to share his success story (aka How to buy 10,000 houses), personal investing tips and dish the dirt on what really goes on behind the scenes of this hit TV show. 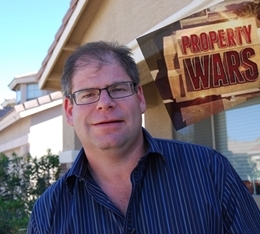 Doug Hopkins is a ninja real estate investor from Phoenix, Arizona and star of the hit TV show Property Wars on the Discovery channel. In this interview, Doug candidly talks about how he got started as a real estate investor and what he is doing about the changes in the real estate market. Buying foreclosures down at the courthouse steps can be fun and profitable, yet risky business… and Doug has successfully purchased more than 10,000 houses this way. Hi bio in detail and how he became a successful investor. How to play the “Auction Game” with the big dogs in hedge funds. The influences that are affecting property volume when it comes to auctions. Getting your Realtor license – does it help or hurt you? Should you offer sellers the list price or negotiate lower?